Do you know what I love about magazines and journals? A pages content, is on a single page. No scrolling, no links, physical paper that can be absorbed and enjoyed. Do you know what I love about a blog? I can write for days, and post as many photos as I want in a single post. Endless scrolling, random rambles, links that are more distracting than when Cat Fish is on TV (it can't only be me who gets distracted, right?). So, do you see my dilemma? I equally enjoy each of these platforms for their utter opposing reasons. Stay with me, I'm getting to a good point! If I don't physically write something down, I will forget it. My desk is littered with notebooks, filled with lists of lists. Of course doodles and cursive practice accompany these lists, but the lists do still exist. Since I can remember I have been subconsciously drawing when there is a writing utensil in my hand. I recently dared myself to let my imagination run wild and say yes to wherever it leads me, so today marks a new adventure on my blog. 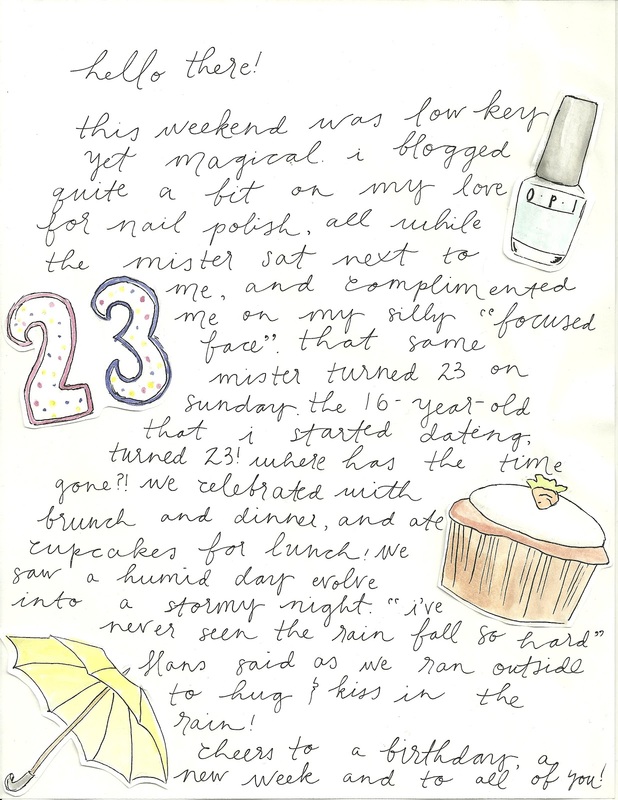 Every monday I will be recounting my previous week, weekend or both, through a diary entry. These will be my personal doodles along with some highlights or activities that I find necessary to point out. I do not want to set any rules for myself expect to recap something that happened in the previous week. Other than that I want to keep this simple, fun and mostly, organic. I hope you enjoyed Monday's content! Side note: I was born on a Monday so all of the more reason to be happier on Mondays. Hello there! This weekend was low key yet magical. I blogged quite a bit on my love for nail polish, all while the mister sat next to me, and complimented me on my silly "focused face". That same mister turned 23 on Sunday. The 16 year-old that I started dating turned 23! Where has the time gone?! We celebrated with brunch and dinner, and ate cupcakes for lunch. We saw a humid day evolve into a stormy night. I've never seen the rain fall so hard, Hans said as we ran outside to hug and kiss in the rain! Cheers to a birthday, a new week and to all of you!